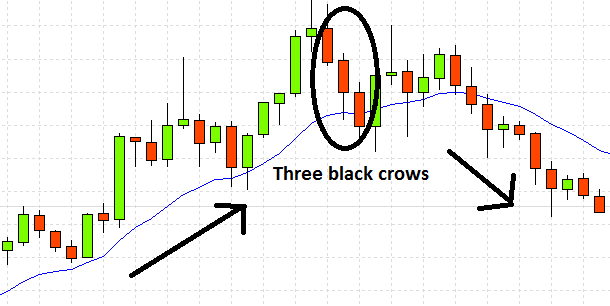 Normally, the Three Black Crows Pattern in an uptrend signals the bearish reversal of the trend. And, in a downtrend, it signals the continuation of the trend in the same direction. In this way, the traders are able to identify the movement of a prevailing trend. If you use it effectively in your binary trading, you can derive immense profit out of it. Read on to know how you can do it without a mistake. 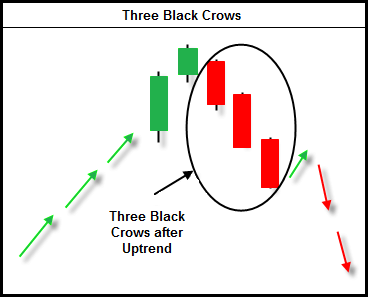 The Three Black Crow Pattern sends moderate signals of possible reversal during an uptrend. These signals are not strong enough. Only when such a formation occurs in an established uptrend, a trader should rely on its patterns. The signals send by these patterns help the traders to predict that a downtrend is inevitable with the weakening of the uptrend. Individually, the three candlesticks have no lower wick and they show that the price is declining gradually. Generally, they are bearish and are long. Despite this fact, when they become exceptionally long and show gradual declining of the price, it is indicating that your asset is being overvalued. I recommend trading this reversal pattern only when a major support or resistance level is hit. By using this pattern, the traders through short selling can take advantage of the reversal situation in a bearish market. When the candlesticks form the Three Black Crows pattern, sellers should be sure of the fact that they have gained absolute control over the market as long as this pattern stays. All the candlesticks intermit close to their low points to demonstrate significant decline in the price movement. When sellers are comparatively in a strong position than buyers and the buyers are not opposing them, it indicates that very few buyers are enthusiastic about investing their money in an underlying asset. As a result, the reversal of the trend can be of huge importance. Another great way to trade successfully using this pattern is to adopt the position of short sell with a stop loss that is placed with the closing of the third candle. After that, try to sell your asset at the price point located in the middle of the third candlestick. You can see that even on a real chart, these patterns work. On the contrary, many a time, prices experience a slight increase when the third candle closes. However, you shouldn’t expect them to cause a limit order by reaching the highest point in the chart. In this case, if the price touches the lowest point of the third candlestick, you should opt for buying put option. Just above the second candlestick’s high point, try to place a stop loss order. You can place this order also above the point where the first candlestick opens. Considering whether you want to undertake a low or high risk trade, you should place your stop loss order. You can also use this pattern for binary trading by identifying an uptrend. However, the uptrend should have candles arranged in ascending orders. After that, wait till a reversal takes place. This reversal should be characterized by candles arranged in descending orders. Then, you can go for put option when the third candlestick closes. To sum up, the three black crows are very advancing. The bear market is in oversold condition when each of the three candlesticks is quite long. If this happens, it’s better to not to enter the trade until you get the confirmation of approaching reversal. Being just the opposite of the Three Black Crows perpetual structure, the Three White Soldiers comprises of three primary bullish candlesticks. In the following article you will get an insight about its respective pattern and the ways to implement it into binary options trading. The Three White Soldiers pattern is basically a reversal confirmation pattern, which becomes useful over time to derive meaningful signals for forex, binary and equities. The pattern comprises of three consecutive primary candlesticks, which closes at higher points as compared to the previous day. (Or a candle) As the prices close at superior levels, it results in to a staircase formation, indicating a trend reversal. Each of the consecutive bullish candlesticks closes at higher prices than the former ones. Three important, consecutive and boosting white candlesticks comprises of this formation. The former candlestick paves the way for the new consecutive candlestick. 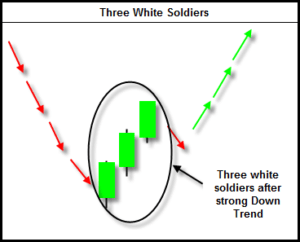 The Three White Soldiers pattern evolves when the markets suffer from low prices for a substantial period of time. This time is marked by new lows or is working its way towards new lows. To win against these lows, the market needs to push itself upward as demonstrated by the organisation of the first candlestick. For the coming two consecutive days, the markets will tirelessly compel the candles to close at higher points. This constant mobilisation of the market will eventually dampen the positions of the investors, who have a pessimistic view on markets. To dictate an imminent downfall of the markets, The Three White Soldiers pattern is an ideal formation. For chart analysis and revealing the necessary outcomes, binary options traders must look forward to implement it. However, it works best for those binary options which boasts of longer expiration time periods of 24 hours or more. Some options like RANGE and ONE-TOUCH features somewhat highest percentage payouts. I recommend trading this reversal only when a major support or resistance level is hit. Three whit soldiers pattern on a real chart. For better trading, volatile currency pairs, like EUR/JYP, GBP/JYP and GBP/USD are considered to be the best. Due to their high volatility, you will be able to gain and realise profits faster and effectively. Also, to trade on other assets like stocks, commodities and indices you can use this formation. Under this pattern, a price movement towards a single direction for a very long time is observed along with a downward trend. Apply binary options strategies like TOUCH and OUT-RANGE, depending on your need and requirement. OUT-RANGE is generally applied when the price channel is cracked and TOUCH is used when the prices reach a fixed price level. However, just keep in mind that the expiration time of these options would be 24 hours, because the pattern have scopes for only medium-term trading. As the Three White Soldiers boasts of a formidable formation, the signals it exudes are around 85% accurate. Hence, you enjoy plenty of ways to enhance your profits. Higher chances of generating profit can also be witnessed by higher payout ratios for options, like TOUCH and RANGE and longer expiration time period.